Turkeys are widely considered to be one of the most difficult animals to hunt; they’re fast and skittish due to their great eyesight and hearing. One way to lure a turkey into a kill zone would be to use a turkey decoy, which instills a false sense of security in your quarry long enough to deliver a lethal shot. You won’t be bringing home the bacon; you’ll be bringing home a big fat turkey. In this article, we will discuss the various turkey decoys on the market, as well as what to look for when buying a turkey decoy. 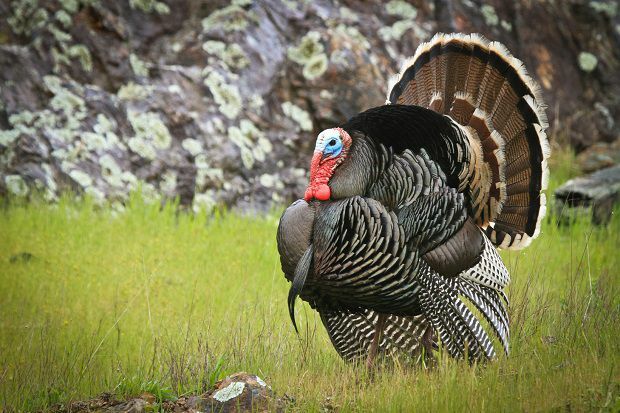 What Makes a Great Turkey Decoy? There are certain features that might be unique to your turkey decoy that makes it the best on the market. This section will discuss exactly that; what makes a turkey decoy the best? There are some particular features or qualities that you should look out for when buying a turkey decoy. One of your main priorities should be finding a decoy that looks exactly like the real deal. Turkeys are smart animals and won’t be fooled by a cheap cartoon-like decoy. You want something that, at a glance, looks like a real turkey. You should also look out for a turkey decoy that can be adjusted into different positions in order to make it look more real. Turkeys will adapt to different situations constantly. If you can replicate convincing poses, like how turkeys lift their feathers to attract a mate, you might have a greater chance of luring more turkeys. You don’t need a heavy turkey decoy. If you can find one that can easily collapse and be stored away in a bag, which many of them come with, this is a great advantage. You should make sure you have something lightweight and compact enough for your hunting trip. The review section is one of the more important areas of our article; this is where we will describe several products on the market that are known to be the best. They all have different benefits and some downsides. 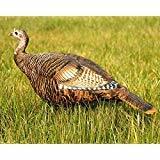 This turkey hen decoy will be an effective tool in attracting any dominant or submissive toms in the area, as well as other aggressive hens looking for a challenge. You can buy these collapsible decoys as a single hen or in packs of up to five. These lifesize lookout hens are some of the most popular because of their dominant stance, which acts as a sign of aggression to competitor hens and great mating material for any toms. The one-piece folding stick will give you some movement which makes it look realistic but doesn’t scare anything away with fast, sudden movements. The hen is made from Dura rubber, which makes creasing and dents less likely. This hen offers you a realistic turkey decoy that definitely works thanks to its life-like paint scheme and positioning. It’s also fairly portable thanks to the collapsible design of the decoy. The Dura rubber that’s used to make the decoy is great for durability. This material might limit the chance of any dents and creasing, though on occasion this product can still suffer from dents. The folding peg used to keep it upright is great for mimicking natural movement which helps ease any nervous turkeys in the area. The runner up for this list is an inflatable, three-in-one turkey decoy. This decoy can be stored within your pocket and easily inflated in only a few minutes. It’s the lightest type of turkey decoy on the market. You have the ability to adjust this decoy into three different poses including the breeder, feeder, and looker. 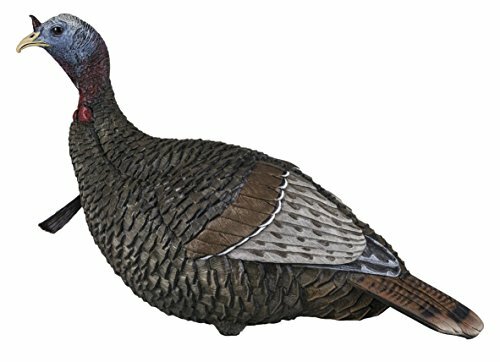 This decoy has feather cuts that make it look more realistic and create a natural effect. You can also easily adjust the neck and head for different positioning. The inflatable design of this turkey decoy allows you to easily carry several decoys in your pocket or backpack. The 3D look and realistic movement help with attracting more turkeys. However, the downside to this decoy is that the inflatable design makes it less realistic looking, even with the feather cuts that blow in the wind. One of the greatest advantages of this product is the three-in-one poses, which can attract different kinds of turkey with just one decoy, saving you money and space. The remaining downsides include the fact that inflatable decoys are a lot more likely to burst if another turkey attacks them or if you accidentally shoot it. They also take longer to set up for people who might not have the strongest lungs. Smokers and asthmatics beware. This realistic jake decoy will offer you plenty of opportunities to bring home some turkey for dinner. You can pack away this lightweight decoy in your backpack. You will be able to adjust the positioning of the neck and head to offer different stances, whether they’re submissive or aggressive. The realistic paint scheme also means that any curious turkeys in the area won’t be scared of coming closer to investigate. The stick used to keep them upright also creates great natural movement. It’s commonly known that in most value-for-money products, quality is sacrificed in order to save on cost. This isn’t the case for this turkey decoy. This lightweight decoy will be effortless to carry around, which is a top priority when looking for a decoy. The neck and head are also adjustable to offer a more realistic look; the paint scheme also helps with this, as well as the natural movements the stick makes. These benefits are all common features of a great turkey decoy. However, there are still some downsides such as the fact that these decoys are in a solid state and can’t be collapsed or folded to make them more portable. They’re also harder to pack into a rucksack because of their bulkiness. This turkey decoy is slightly different from the rest, in that it allows for close range shots that the turkey won’t expect. By using this product as both a decoy and a hiding spot, you’ll most likely be walking home with a few turkeys in your bag. 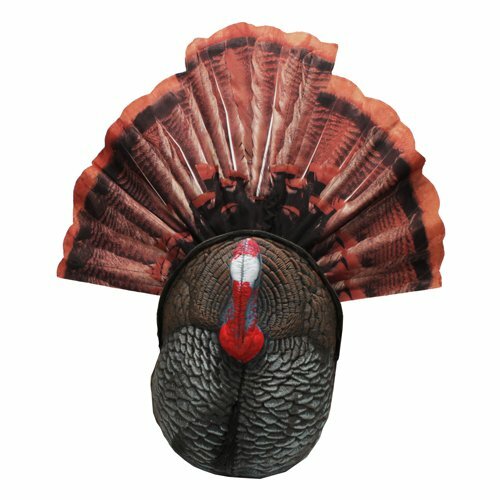 This brand new technique is also easily adjustable, as it has a realistic removable tail and attachment hub if you ever want to use a real turkey tail for an even more realistic feeling. The gobbler will attract other aggressive turkeys in the area, which most of the time will attack your decoy and come considerably close to you for a great shot. This decoy offers hunters an alternative hunting technique and a unique experience. 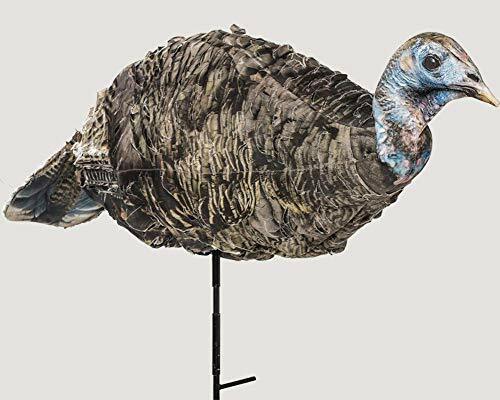 You’ll never have to look for a decent hiding spot when you can just hide behind this gobbler decoy and shoot from only meters away, a truly exhilarating experience. For an even more realistic look, you can remove the tail that is included and attach a real turkey tail from the attachment hub; this is a huge deal for any hunters wanting to make their decoys even more realistic. However, it’s not the most realistic decoy on the market and you might need to add a few things to make it more life-like. It’s also not portable like other collapsible or inflatable decoys. This turkey decoy is the best of the David Smith range. It’s designed with an upright posture that mimics the natural movement and positions of a hen. This decoy will attract the attention of toms looking to mate. The structure of the decoy is superior to any other decoy included in the range as it has iridescent UV reflective feather details that will ensure that other turkeys are curious and are fooled into approaching. The patented ACE technology will ensure that the look and feel of every turkey decoy last far longer than the competitors. Not only that, but you also get a carry bag and ground stake with this product as well. This product is without a doubt the best currently on offer from the David Smith range. The natural posture is always a benefit when turkey hunting; you want a decoy that’s very realistic and that’s what you get here. The UV reflection also attracts any turkeys in the area out of curiosity. The ACE technology is something never seen before on turkey decoys; this tech will ensure the long-lasting quality of each decoy from this range for years down the line. Another smaller bonus is that you get a handy carry bag to put the decoy inside. The only downside to using this product is that because it’s not collapsible it takes up a lot more space. This remote controlled and motorized jake-styled turkey decoy will without a doubt attract interest from any turkeys in the area. The remote control can lower and raise the tail, which makes the decoy far more realistic than any other movement made by standard decoys. The tail can also be removed and replaced with a real turkey tail via the attachment hub. You’ll also never need to worry about the battery life, as it lasts up to eight hours—more than enough time to take your shot if you’re in the right area. This turkey decoy is a more modern approach to hunting turkeys. You can control the decoy by remote by moving its tail up and down. This could help attract some aggressive or dominant toms and hens. The removable tail attachment can be replaced for a real turkey tail that helps with the realism, another benefit. The final benefit of this product is the fact it can last for up to eight hours on a single pair of batteries. The only downside is that it’s somewhat 2D in shape and sometimes the sudden movement of the tail could scare away your target. This inflatable turkey decoy comes as a pair, which is great for several setups to attract unsuspecting turkeys in the area. The lightweight decoys can be easily inflated within minutes or stored away in your jacket pockets. They’re fairly quiet to set up and can be adjusted for multiple setups. These realistic turkey decoys are both 3D and have fabric feathers that will blow around in the wind. The folding peg also allows the turkey decoy to move slightly which gives it a more natural look from a distance. These decoys are some of the most realistic on the market. The adjustable bodies and natural movement allow for a realistic feeling, which ultimately attracts plenty of turkeys in the area. They’re inflatable, making them easy to carry around and extremely lightweight. The only downside to inflatable decoys is that they can be punctured easily from an attacking turkey or shot. They also take a few minutes to be blown up and this might be a struggle for anyone that has breathing problems. There are a few different turkey decoys that are used in certain situations. This section will discuss the situations you might use certain decoys and just a few general types of turkey decoys that hunters use. 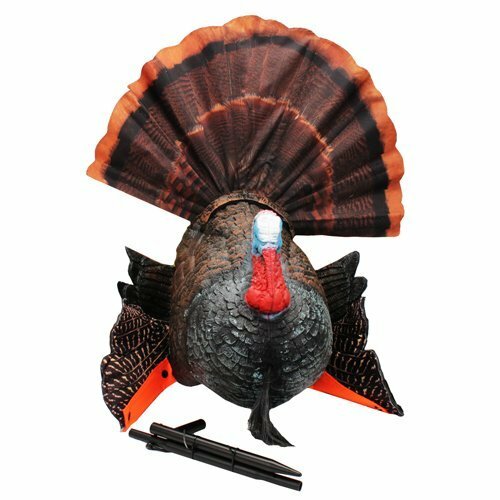 The inflatable turkey decoy is the most compact and portable, as it acts just like a balloon. You do need to be careful when carrying these around as they can be easily punctured. They also take a little longer to set up as you need to blow them up, which some hunters might find easier than others. These collapsible decoys are far more life-like and can still be stored fairly easy thanks to their compact design. This is the most popular type of decoy to buy. Be sure not to have it stored away compactly for too long as they might become deformed. You could fix this by using a hair dryer to reform it. Tom decoys mimic these mature birds in a full or half strut position. This is an aggressive stance towards any dominant toms in the area which could result in other toms wanting to fight. These decoys will attract aggressive and dominant toms but scare away any subordinate toms or jakes. If you’re using a hen decoy, you’ll be wise to use it during the springtime to attract any toms looking to mate. Jakes and subordinate toms will likely come in droves to a single hen, you could easily use a flock to attract even more. There are several benefits to investing in a great turkey decoy; after purchasing a decoy you’ll never look back. Here are a few reasons why it’s a great idea. How many times have you bought some expensive bait or lure and it hasn’t worked at all or not as well as you hoped? Too many times! What better way to lure a turkey in by using its own instinct to reproduce or stick to flocks. A group of decoys will offer a cheap solution to this rather than those more expensive techniques or products. Often when you are using the correct turkey decoy and it offers a realistic appearance, you won’t have to wait long for your chance at a big fat turkey dinner. 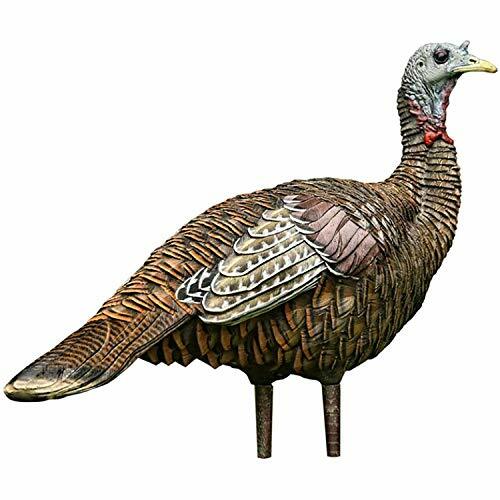 Most hunters mix this turkey decoy with wild turkey callings for the best results. A great turkey decoy will be simple to use and set up. It’ll offer plenty of different positions to be adjusted into as well as having the most realistic look. It should be able to offer you some really good opportunities to take a shot at some turkeys. There are various ways you can set up your turkey decoys. It all depends on the environment and time of year, and there are several variables to consider. However, the following guide should help you. Step One: Most of the time, you’ll be using a blind or camouflaged area where you have a decent view of the decoys; make sure you do this a few days ahead of time to allow nearby turkeys to get used to the new addition to the environment. Step Two: Place your decoys in plain sight (around 15 yards away) of where you’ll be hiding, in order to get a clear shot at unsuspecting turkeys. Step Three: You’d be best using a three decoy setup with two hens and a jake. The more hens the better, as you’ll find toms being fairly attracted to this setup. Step Four: When placing your decoys, don’t have them too close or too far apart; 5 feet apart should do perfectly. If the decoys are moving around too fast due to the wind you can stop this by sticking a peg or stick into the ground next to them. Any novice hunter might be surprised by the variations of turkey decoy and the need for multiple strategies for different times of year. We hope that we’ve helped to increase your knowledge with all the information we’ve provided and the products we’ve listed in this article. This section contains a couple of commonly asked questions that we get regarding turkey decoys; we’ve tried to answer them to the best of our knowledge so we hope this helps. How far should you stay away from your decoy setup? It’s recommended that you stay around 15 yards away from your decoy setup. However, you can be as close as 5 feet away if you really want. Turkeys don’t sense you until you start moving, kind of like the T. Rex from Jurassic Park. How many decoys do you need? You can have as few as one or numerous decoys; as long as they’re placed strategically it doesn’t really matter. We recommend a setup of three decoys, including two hens and a jake to attract those larger toms towards your setup. As wild-turkey hunting becomes more and more popular (wild turkey populations are exploding), the turkeys are becoming smarter and smarter. Savvy hunters need to employ all attractants to get a big gobbler within shooting range—be it gun or bow. One critical component is the use of turkey decoys. What kind? How many? Here are some things that have worked for many successful hunters. Many hunters opt for the simplest and lightest decoys available. That way they don't have to carry loads of weight through brush, timber, and big areas—and that's a real consideration. With all of the equipment a hunter has to carry, every extra pound becomes a burden—literally. We'll mention some specific brands, but that isn't an endorsement of any of them—just something that you can look-at while shopping for decoys. There are wide choices of manufacturers and brands within a particular style. So do some comparison shopping, and pick up the decoy that you like best. Experienced turkey hunters and the staff at the stores carrying these decoys will be able to help. There's what is called Carry Lite decoys. They're made of real thin Styrofoam, which you can roll up and put in your pocket. Once in the woods you unroll them and set them up. This type of decoy is particularly useful when heading into deep timber, with limited carrying capacity. And they work. There are many varieties of hard plastic decoys that closely resemble a turkey and imitate their look and expression very well. A personal favorite of guide Phil Schweik is called a B-Mobile. It's very realistic, looking like a classic strutting gobbler. It has a fully erected fan in the back. What some real serious and savvy turkey hunters do, however, is to replace the fan that comes with the decoy, and put on a REAL turkey fan which makes the B-Mobile look ever more realistic. Using this particular type of decoy has proven extremely successful. It seems that the Toms—be it a younger bird or an old wily gobbler—can't resist approaching the decoy. The presence of another big Tom in their breeding area and territory is of course unacceptable. These wild turkeys will peck, fight, attack the decoy—challenging it—and often jumping right on it. It's that "real" to them. A relatively new type of decoy is called a Turkey Skin. They are actual turkey feathers that are made into a type of "wig" that fits over hard plastic turkey decoys, and make them look so realistic that even some hunters find it difficult to differentiate the decoy from the real thing. These particular decoys can be relatively expensive, but they work real well. As for "numbers" of decoys to set out, Phil Schweik suggests to usually put out a Tom and two hens—maybe a couple of Jakes (younger birds); a Tom and a hen—the combination possibilities are endless. But you don't need a lot of them. You can also use decoys that have different types of mounting apparatuses. Some decoys are mounted on solid stakes, some have mobile bases that spin around or have head movement, or "feather flutters." Others decoys have adaptive strings that run back to your blind, whose movement and stance can be controlled by you as an even greater attractant, and bring a bird in. Turkey hunters have many different scenarios to work with, and try—some will work better than others depending on the variables present on the day you're hunting, and after a few hunts you'll be able to know which decoy and set up will work best for a particular situation. Now—while not meaning to "rain on your parade," don't think that because you've got some truly "neat" decoys with all the bells and whistles, that that, in and of itself, is going insure that you'll get that 25-pounder you've been wanting to brag about at your neighborhood bar for the past ten years. "Ain't gonna happen!" What determines a successful hunt is the use of a proper combination of concealment, set up, weather considerations, hunting area, decoy use, weaponry, camo, and proper calling! They all work together. So, do your homework, make "friends" with, and listen to experienced hunters, go to a seminar, watch some videos, read our own and other previously-written articles which are on this excellent website on proper calling, blind set up, weaponry, weather, equipment, concealment and camo etc. In the end using all of the information available to you, and, with practice, and yes, some "failures," you're going to end up with that "big bird." Motion decoys have been used in waterfowl hunting for quite some time now. Most waterfowl hunters either own a spinning wing decoy or have hunted with one. However, motion is generally underused when it comes to turkey hunting. A lot of hunters don’t want to be bothered with carrying larger decoy rigs or longer setups. Motion decoy manufacturers have answered these complaints with lighter, smaller, and easier to use motion decoys. A motion decoy adds another degree of realism that could be the difference between a turkey hanging up out of range and fully committing. The range of motion these decoys create is vast. Some have bobbling heads, some spin, others bring their tails up into a strutting position. One of the most interesting motion decoys on the market is the Reel Turkey Feeding Hen Decoy from Edge by Expedite. This decoy bobs up in down as if it were feeding. The decoy is also set up on a ski-like device that allows the hunter to literally pull turkeys in when they hang up. The reel comes with two hundred feet of line so it’s possible to pull a gobbler in from a long way out. A hen decoy is packaged in the box, but converting the decoy to a strutting gobbler is a cinch. Just attach your decoy, like a Primos B-Mobile, and you’re ready to go. No turkey decoy is 100% effective. There are days when toms just won’t cooperate for a variety of reasons including weather, hunting pressure, and breeding cycle. But a motion decoy could be all a wary gobbler needs to see to let his curiosity get the best of him. When people think of turkey hunting, decoy placement seems to get over shadowed by calling, scouting and roosting. All of these are very important parts of turkey hunting success. The methods and understanding of the placement of your decoys contribute just as much to a successful hunt as every other part of the equation. Place decoys in an open area, like an agricultural field, power line corridor, or clearing in the woods. Decoys need to be visible to approaching turkeys. The decoys are visual tools used to give wary birds something to focus on as they approach. Sometimes the appearance of other birds in the field will give old toms just enough confidence to close the distance to your set up. When it comes to placing decoys, distance is the most important part of your setup. Placing decoys too far away or too close can have adverse effects on the success of your hunt. Place decoys no further than 25 yards from your hiding spot. If the decoys are too far, the tom you pursue could hang up out of range. By sticking with the 25 yard rule, if the bird stops 15 yards from the decoys, he will still be within ethical kill range. Remember this rule changes for bow hunters and younger hunters. Decoys should be moved closer to reflect the shooting ability of the hunter and the equipment they use. Decoy arrangement may be seen as just random placement of decoys in the field, but there is some method to the madness. There are three basic arrangements for decoys and understanding them may give you an upper hand in the spring woods. Walking: This arrangement involves positioning decoys in a row, like they are walking or filing off a field. When using this method place turkeys in a row facing all in the same direction, hens in the front and male decoys trailing behind. When placing decoys in this arrangement make sure that decoys appear to be leaving a field, this gives toms a sense of urgency to catch up before the hens disappear. This arrangement works well in areas that turkeys migrate through from roosting to feeding areas. Feeding: This setup is a random pattern that most hunters use. The feeding pattern usually has birds in the feeding position, with their heads down as if they are picking seeds off the ground. When placing birds in a feeding arrangement, remember if you are using a male decoy, have it facing you and place it behind the hens in your set up. You want that bird to come in and face your male decoy giving you opportunity to get ready for your shot. Mating: This arrangement is exactly what it sounds like. Position your decoys to simulate birds getting ready to mate. This arrangement is set up with a hen placed directly on the ground, with a tom or jake standing behind her. This decoy setup shows that the hen has become submissive and ready to breed. It will often elicit a fight or flight reaction, either birds will run in looking for a fight or will run away. Young birds will often steer clear of dominant toms, where a dominate bird will run in to fight for the submissive hen. When hunting remember there is no magical setup that will produce birds every time in the woods, a hunter needs to adapt and learn from their days in the field. If a setup doesn’t seem to work for you the first day, change things up a little and try a different arrangement or decoy grouping. Your ability to adapt to the situation will help to ensure your success and knowledge of the game you pursue.